We are providing Crickets Control Service for all Commercial and Industrial spaces. Being an eminent business entity, we are involved in the sphere of delivering Crickets Control Service to our clients. Obtainable with us in numerous provisions, these are immensely demanded. Furthermore, these are delivered after specifically comprehending the varied desires of our clients to attain their cost effectiveness and promptness. Being an eminent business entity, we are providing Crickets Control Service to our clients. 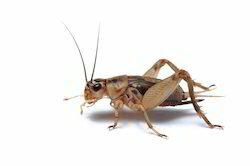 HPCS provides Crickets control utilizing the latest methods of Integrated Pest Management. Crickets are somewhat grasshoppers and more closely related to katydids or bush crickets (family Tettigoniidae). They have somewhat flattened bodies and long antennae. There are about 900 species of crickets. They tend to be nocturnal and are often confused with grasshoppers because they have a similar body structure including jumping hind legs. House crickets are commonly found in houses, suviving indefinitely. They are most well known for their loud chirping caused by rubbing their front wings together, attracting females.